In our continuing efforts to expand our range, especially in the CONCACAF region, where we reside, we're super proud to bring you, for the first time ever: from Panama The Official Lotto Tauro Fútbol Club Home Soccer Jersey! They're not named after the Ford sedan or the zodiac sign, but more aptly, after a 'toro', bull: that universal and multi-cultural symbol of strength. 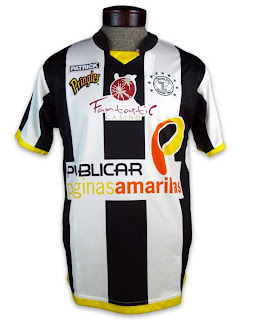 The team was founded in 1984 and played in a regional league until the establishment of the professional league - Asociación Nacional Pro-Fútbol (ANAPROF for short) in 1987. Since then the Bulls have become the giants of Panamá, winning a record 7 First Division (or Liga Panameña de Fútbol) championships.